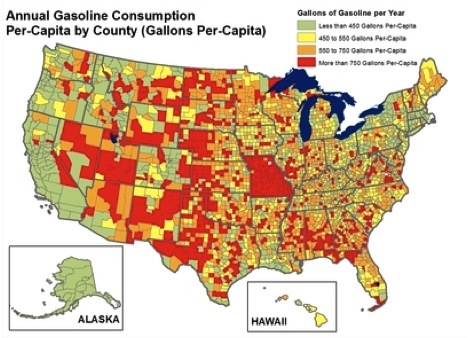 A few weeks ago we reported on a newly released county-by-county map of the U.S. that seemed to show Missouri per-capita gasoline use as the highest in the nation. It turns out the Missouri is among the highest states for per-capita gasoline usage--but not quite at the very top. 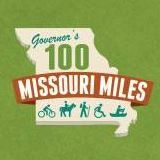 Missouri ranks seventh highest in per-capita miles driven, with 11833 miles per resident per year. That put us at about 2000 miles per person per year above the national average of 9608. Highest per capita was Wyoming--not surprising as a large, rural state with very small population--followed by Mississippi, Alabama, Oklahoma, New Mexico, and North Dakota. The lowest per capita driving states are dominated by those with large urban populations: DC--a small, densely populated completely urban area--was lowest, followed by Alaska, New York, Hawaii, Nevada, Rhode Island, Pennsylvania, and Illinois. The surprises there are Alaska and Nevada. Alaska, like Wyoming, is a very large, rural state with small population. Both states have 65-70% urban population (the U.S. average is 79% urban), so it is surprising to see them at the opposite ends of the map. Nevada is not as surprising as it might appear at first glance. It is a large state with a very large, unpopulated rural area. But by population, Nevada is one of the most urbanized states--88% of the population is packed into the Las Vegas and Reno urban areas. Why is Missouri among the highest states for per capita miles driven? Some of the difference among states can be explained by the percentage of urban and rural population. Urban areas are naturally denser, residents are closer to populations and services, and more transportation options are available--work, school, shopping, and recreation are more likely to be within reach of transit, biking, or walking. Of those states, all are above 10,000 miles per capita annual VMT, but only Oklahoma actually tops than Missouri. What are the other factors? Well, many of them are the ones that we keep harping on year after year here at MoBikeFed: Missouri has fewer transportation options. Many parts of the state have few or no good, safe bicycle and pedestrian facilities available near residents and connecting important destinations. Transit connectivity is weak and systems are chronically underfunded. Our planning for growth is poor and the result is many dispersed suburban developments dependent by design on single-occupant automobile travel. Low fuel taxes--Missouri has the sixth lowest gas tax in the nation--encourage more driving. When we improve those factors we'll have a state friendlier for bicycling and walking and the number of miles driven--and greenhouse gases and pollution produced--will naturally go down while the population's health improves. Missouri is making progress now in these areas. If this progress continues it wouldn't be surprising to see us drop of the the top 10 states for per capita miles driven over the next 5 or 10 years. This map uses a similar methodology to the NRDC's county-by-county map: We started with the Federal Highway Administration data on the annual miles driven in each state then used U.S. Census data for each state from the same year to figure a per-capita miles driven. The map above shows the results. States with lower per-capita miles driven are light green while those with more pre-capita miles driver are darker green. We looked at it state by state, rather than county by county as the NRDC did. We used the FHWA's 2010 data, which is the latest available. NRDC divided by the national fleet average MPG to get a gallons-per-capita measurement (they didn't adjust for local or regional differences in average MPG, which are very slight within the U.S.). We have left the data as miles per capita driven, which in the absence of any adjustment for differences in local average MPG gives the same comparison among states (U.S. fleet average MPG is about 20, so divide the above miles-driven figures by 20 for a direct comparison do the NRDC data). MO has 5th lowest gas tax, 2nd lowest gas price, 9th highest miles driven - 24/7 Wall St.